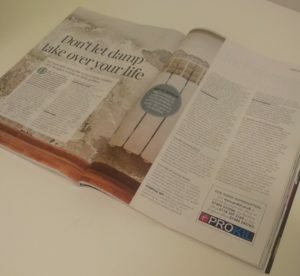 Prokil Featured In At Home Magazine! Home > Company News > Prokil Featured In At Home Magazine! 29 Jun Prokil Featured In At Home Magazine! We are proud to announce that we were recently featured in the At Home Magazine, a premier celebrity and lifestyle magazine sold here in the UK. The magazine regularly features advice and tips from celebrities such as Lorraine Kelly, Sarah Beeny and James Martin. Due to our standing in the industry, we were asked to write an article about damp. We used our 50 years of experience to provide homeowners with valuable tips on how they could combat damp in their properties. Damp can be caused by many factors such as an absence/failed damp proof course (DPC), lack of property maintenance, bad building work and leaking roofs. This can lead to problems like Penetrating Damp, Rising Damp and Condensation. Read more on our damp proofing page for more details. We were selected to write for this magazine due to our 50 years of experience in the damp and timber preservation industry. As proud members of the Property Care Association (PCA), we are proud to offer homeowners around the UK advice on damp. Our company works all over the South of England particularly in Bournemouth, Southampton, Brighton and Reading and we have treated many properties over the years. To combat damp in properties, we remove the existing plaster from the property’s walls and then inject a Chemical DPC solution. Once this has been completed, the treated walls are be re-plastered by our plastering experts. If your property suffers from condensation, then we will install Passive Air Vents (PAVs) as these will help to discharge and control excessive moisture levels. If you suffer from damp, get in touch with our team and we will provide a solution for your property today.